Dear reader, I like to imagine you reading this blog just as I write it, with a plate of something at your side. Is it a delicate cup of tea with a shortbread balanced across the rim, or perhaps a bowl of spaghetti, dressed with a zesty tomato sugo? If this is the case, please navigate away now, perhaps to one of the other wonderful food blogs to the right, and return when you are suitably food-less, otherwise you may be food-less in another way less pleasant. Vegetarians, you may want to sit this one out. Is your snack over? Plate in the sink? Let's begin. Babylon Restaurant is a little piece of Iraq in the heart of Footscray. 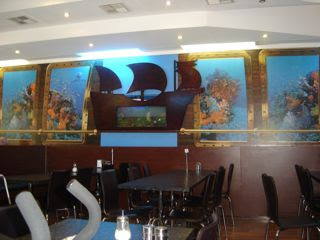 It is family-run with very friendly service and an enchanting, if somewhat bemusing, undersea theme. Last time, I was entranced by the Iraqi delights on the menu, nestled between broader Middle Eastern dishes such as felafel and kebabs, as well as pizzas and lasagne. In a previous incarnation, your host, Ms Baklover, majored in Arabic at university. Since descending into the purgatory of small children, the furthest this has gotten me is an extra piece of baqlawa at Victoria Sweets. So I relished this chance to use some of my hard-gotten gains to sort the pita from the pizza, as it were. We were drawn to Tashreb and Barche which appeared on the menu with no further explanation. As we chatted in Arabic, the very friendly server sketched out the dishes and confirmed happily that these were the Iraqi real deal. 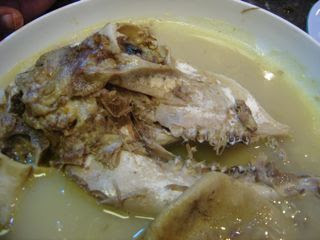 Now I didn't go in blind, I knew Barche involved offal, but my kokoreç-loving father was by my side and ready to step up. 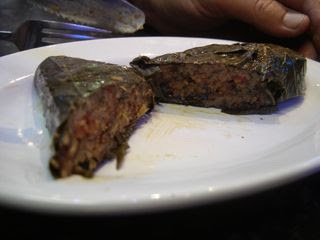 We started with a type of dolma or stuffed vine leaf to share. 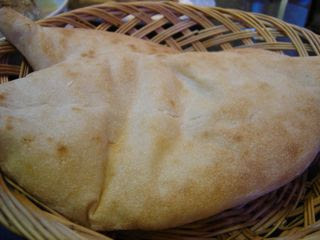 It was fatter than usual, filled with a tangy mixture of rice, meat and tomato. Very good. Now some people can't eat a whole fish because the whole staring-eye thing creeps them out. You try that with a sheep's head! Yes, it is a proto-sausage, innards filled with a fatty rice and mince mixture. I did warn you!! Dad tucked in, slurping and groaning with pleasure. Just another day at the office for a man who goes to yum cha just for the chicken feet and special order of duck tongues with extra jellyfish. My daughter loved the "sausages". 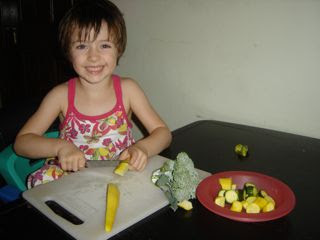 Children are amazing - before a certain age they have none of the cultural hang-ups of adults and will eat purely guided by flavour. 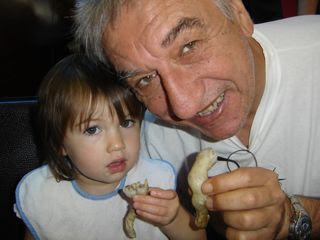 At two years old, my elder daughter once ate all the offal off the top of a congee I mis-ordered, while I shuddered in horror. Me - I was reduced to a pre-teen shadow of myself. Remember when, faced with some horrifying meal prospect like broccoli soup, your parents insisted you "try it"? You would then dip the tip of spoon in one millimetre, touch it to the tip of your tongue before insisting, "see, I did, and I don't like it!" Well, that was me. I couldn't even touch the proto-sausage, I had to extract a little of the filling with just the tip of my fork. 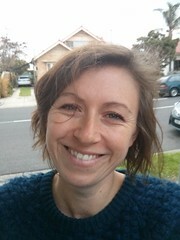 Footscray Food Blog - not faddish, but far from fearless! Our Tashreb arrived, and if you want to geek out on Arabic grammar with me, the root of this word is shariba, to drink, and tashreb translates as "soaked". 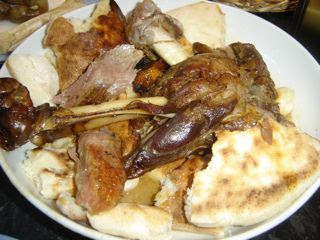 The dish is a luscious, meltingly soft lamb shank which has been lovingly cooked for hours with bay leaves and other spices, atop pillowy, torn Iraqi bread that has soaked up all its salty, fatty juices. This came with plenty of delicious Iraqi bread, which has the fluffiness of Turkish bread with a chewier crust. 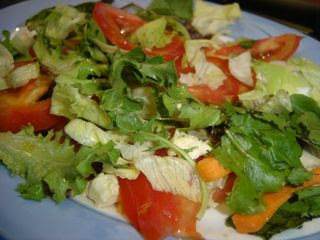 The salad was undressed and a bit tired, a little disappointing. The Tashreb was delicious but unfortunately, I was done. Now before you cross Babylon Restaurant off your list and go back to eating at Souvlaki Hut, stop! This is a fantastic restaurant. They are unflinchingly authentic and I respect them for not trying to tone it down or steer us away from their delicacies. We waited for a while for our delicacies and during that time, the food I saw coming out of the homely, family-run kitchen looked fabulous. Fat, crispy felafels, chicken Maryland in a golden herb rub, rice studded with jewel-like vegetables and dusted with toasty-brown spices. 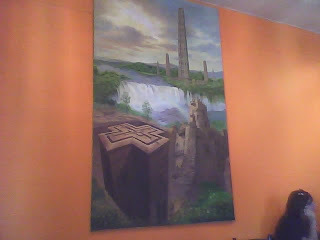 Babylon, I will return! Maybe for a vegie platter next time though. Last post, we learned how to make our own tamarind "water" or purée. This can be used to make tangy tamarind chutney, accented with ground cumin, perfect for dipping samosas, or any number of curries, from Ayam Sioh to Dhansak. My #1 thing to use it for, though, is Pad Thai. I have been using this recipe for years, although since having children, many of the ingredients have gone out the window. 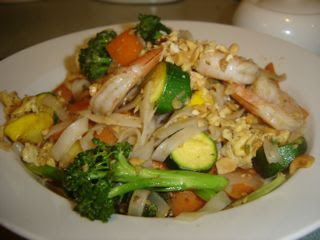 A word about Pad Thai. I have heard many unkind things about this dish over the years - that it's not "real Thai food", that it's just Chinese noodles with Thai seasonings, that it's use as a "yardstick dish" to judge a Thai restaurant is unfair. All of this may be at least partly true - but it tastes so good, I don't care! Hate prep? Have children, and make them do it for you! Chopped peanuts, perhaps 1/3 cup? Soak noodles in hot water until al dente. Drain and set aside. 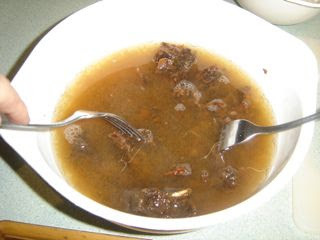 Mix tamarind, fish sauce and palm sugar in a small bowl. 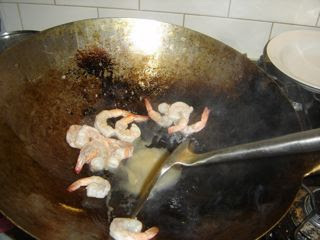 Heat a wok to smoking point. Add oil, drizzling around the sides. Add prawns and cook over high heat until just pink. Remove and set aside. 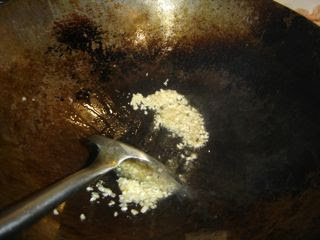 Add another splash of oil and stir-fry garlic for 30 seconds. 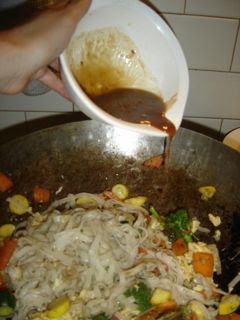 Push noodles up one side of the wok. Add a little oil in the base, crack the eggs in and scramble lightly. 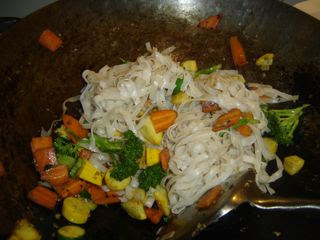 When just set, mix into the noodles and vegetables. 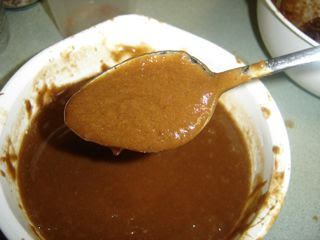 Add your sauce with your lovely home-made tamarind purée. 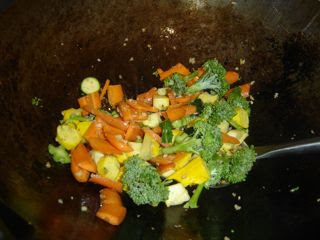 Stir-fry until well combined. Very important: taste a noodle. 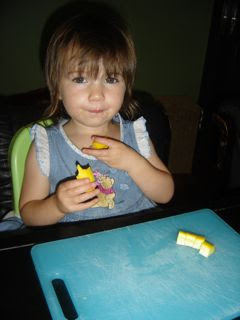 There should be a balance between sweet, sour and salty flavours. If one predominates, correct with a little more of the others, to create a harmonious taste. 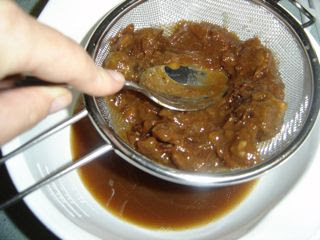 If it needs more sweetness, I just add a bit of white sugar, rather than pausing to grate palm sugar. If you can't taste anything: add more of all three sauce elements. 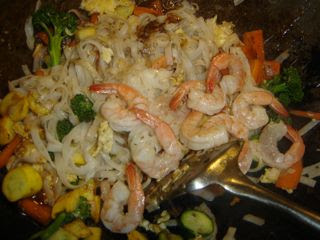 Add prawns and most of chopped peanuts (reserving a little for garnish). Serve, topped with peanuts (plus chopped coriander and a lime wedge if you have). Despite all the cut corners, the home-made tamarind really lifts the whole dish. 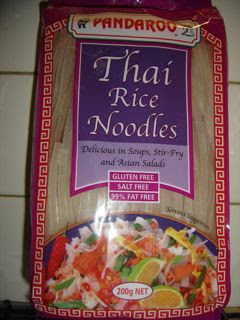 If you rely on Thai restaurants to get your fix, or if you buy those "Pad Thai kits" from the supermarket, please give this a try - you won't look back! 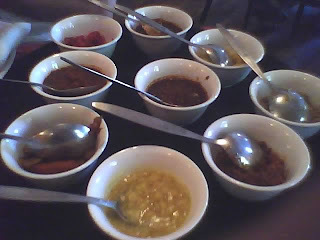 Many great sauces and stews are built on the triumvirate of sweet, salty and sour flavours. Think caponata, the Sicilian eggplant stew seasoned with sugar, salt and vinegar, or a Thai curry with palm sugar and fish sauce, anointed with a squeeze of lime at the end to round out the flavours. 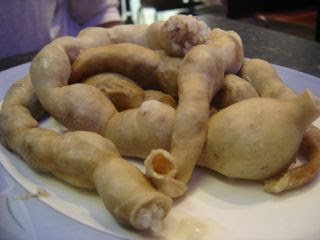 Tamarind is another sour or acid ingredient, most commonly associated with Asian cuisine. It is a truly global fruit, however, having originated in Africa, and since become popular everywhere from Mexico to Madagascar. Its flavour is both sweet, tart and tangy, and it is used in savoury sauces and soups, as well as rolled in sugar and enjoyed as a sweet snack. While living in the US, I became very partial to tamarindo candy - perhaps the precursor to the "sour lollies" that are so popular today! You can buy ready-made tamarind paste in Asian grocers, but if you want the best flavour, you need to make your own. It's really easy and once you taste it, you will never buy the ready-made stuff again! 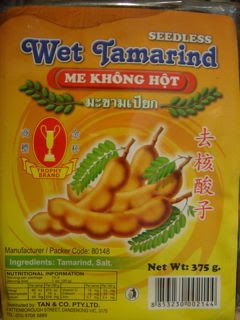 Buy a block of "wet tamarind" (usually around 375g) and put it in a bowl. After a few hours, tip into a sieve atop a bowl. Using the back of a spoon, mash the solids against the mesh, extracting as much pulp as possible. When you have strained as much as you can, place the solids back in a bowl with another 200 ml boiling water, leave for 20 minutes then strain and mash again. You will now have a sieve full of seeds and fibres, and a bowl of smooth, luscious tamarind paste! 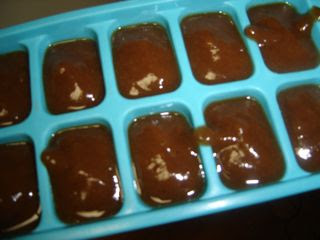 Store in ice cube trays in the freezer. Each cube equals roughly a tablespoon. Stay tuned for some tamarind recipes! 1+1 = 2, right? 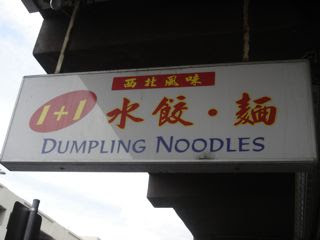 A restaurant that is called, in part, "Dumpling Noodles", sells dumplings and noodles? Nothing overly exciting there. But this particular equation is a little more titillating than you might at first think, because the dumplings and noodles in question are actually Northwestern Chinese! In this region of China, home to the Muslim Uighur people, lamb is widely eaten, wheat is the staple grain and potatoes are also enjoyed. 1+1 Dumpling Noodles will turn all your preconceptions of Chinese food on their head! 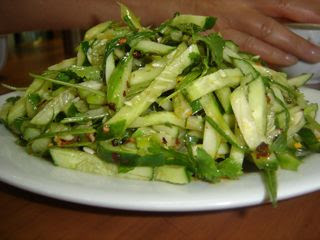 We started with the Spicy Salad ($6) - spanking fresh cucumber, spring onion and coriander in a sesame oil, rice vinegar and chilli dressing. It burst with flavour and crunch. We took this as an auspicious sign that we were in for something different, as mainstream Chinese cuisine avoids any raw foods, seeing them as too damp and cooling for the constitution. 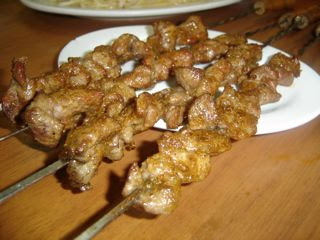 BBQ Lamb Skewers ($2 for 4) arrived, redolent with cumin. It was a total trip to be sliding these tender, smoky morsels from long, wooden-handled skewers, surrounded by Chinese New Year kitsch and chopsticks, when our mouths were telling us we should be seated on Persian carpets, listening to qawwali! These kebabs were seriously good. 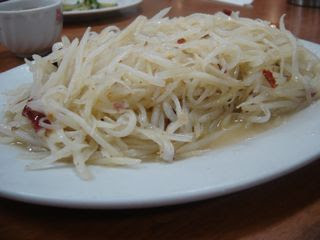 Sliced Potato Stir-Fried with Stir-Fried Spicy Tangy Sauce ($9) - grated potato very lightly cooked in oil, vinegar and dried chilli. A light yet comforting dish. 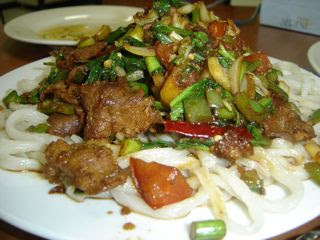 Boiled Noodles with Stir-Fried Pork/Lamb or Veg ($10) - very tender lamb with tomato, green capsicum, garlic chives and dried chillis on top of hand-made wheat noodles. 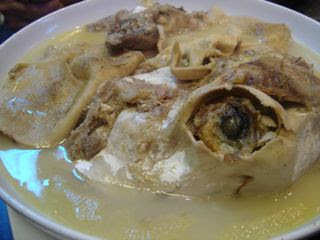 The meat was very tender and flavourful, in a simple sauce of soy and rice wine. Noodles with Pork Mince Sauce ($9) - my dad makes this regularly with pork mince, brown bean sauce and hokkien noodles, and calls it Asian Spaghetti Bolognese. Don't sneer - it's divine! This version was good, but missing the sweetness one is used to with the brown bean sauce. By far the standout of both noodle dishes was the noodles themselves. Fat, juicy, toothsome, in irregular shapes and thicknesses that belie human hands rather than a cold metal extruder. I could have eaten a whole plate of them with just a little (sacrilegious) butter. Be warned though, the tables are sticky, the glass surfaces greasy and the bathrooms, abominable. But if you are a patron of Camy's and the like, you'll just take such things in stride! After so many new and exciting dishes, we couldn't go home without an encore, so the little theatre of Pho Tam's delicious iced coffees was a very worthy final act. Last weekend, West Footscray Library put on a Vietnamese cooking class as part of the Chinese New Year celebrations. 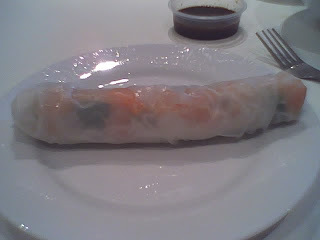 I had visions of bubbling pots of stock for Pho, maybe even whipping up Bo 7 Mon, but we made rice paper rolls. That is cool - they are so easy and healthy, and they deserve to be more widely made in non-Vietnamese kitchens, instead of being thought of as an exotic restaurant dish. 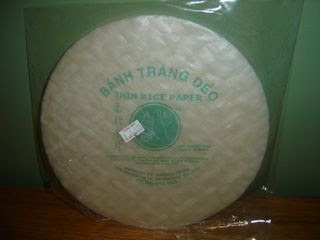 You'll need some rice paper sheets which you can get for next to nothing from any Asian grocer. You can fill the rolls with just about anything, but the classic fillings are cooked pork neck, prawns, herbs such as perilla or mint, lettuce and rice vermicelli. 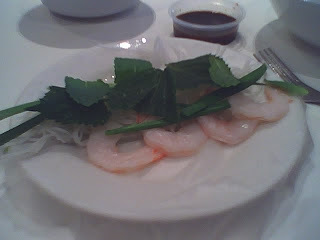 The prawns should be sliced in half lengthwise and the rice vermicelli soaked in boiling water until al dente. You could also try bean sprouts, sliced fried tofu, grated carrot or white radish (try soaking overnight in rice vinegar and sugar first), julienned red capsicum, or deseeded and julienned cucumber. 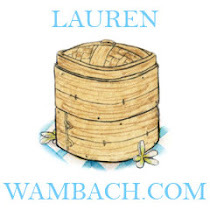 Fill a large bowl with warm water and soak the rice paper sheet until pliable. Place on a plate or board and place your fillings in a line along the centre. Don't over-fill! Fold the bottom part of the roll closest to you up over the filling. Fold the sides over towards the centre, then roll the whole thing away from you to form a neat parcel. Eat with hoi sin dipping sauce. 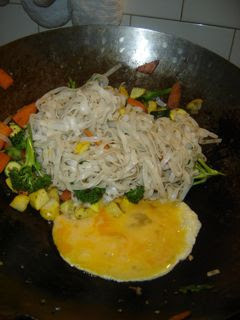 I make mine with equal quantities hoi sin sauce and milk, with a dash of rice vinegar. 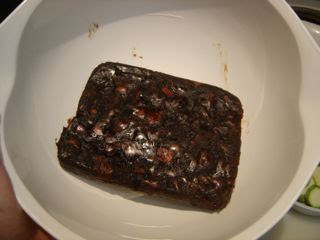 Heat until just before boiling and allow to cool. Top with chopped peanuts. These are so healthy, very low fat and very impressive! My children love them, even though they are full of vegetables. If you are going to make them ahead of time, wrap them in a damp tea towel so they don't harden. Gong hei fat choi, everyone! 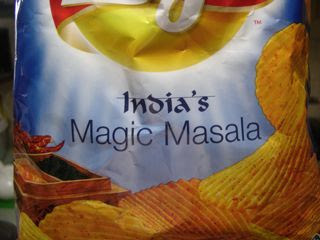 If you are going to eat a packet of chips, make it Magic Masala! These are extra spicy and totally addictive. As the back of the packet says, they "make your heart go DHAK DHAK"! 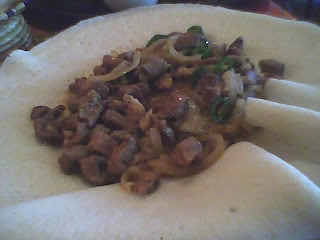 The first time I had Ethiopian food was when I was living in Washington DC. Mr B and I got lost late at night trying to find a gig, and we ended up outside this little Ethiopian diner somewhere in the nation's capital. We wandered inside and although we had no idea what was what, we were so delighted in the food, that was unlike anything we'd ever had. Our hosts were just too hospitable - within a few minutes, the beautiful, hypnotic Ethiopian music and accompanying music videos was replaced by MTV! 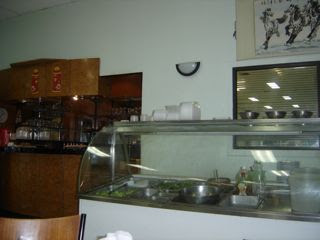 We were delighted to find so many Ethiopian restaurants to choose from when we moved to Footscray. African Town became the firm favourite, although I must admit we became stuck in a rut and didn't try many others. Don't let the crummy exterior put you off - step inside! 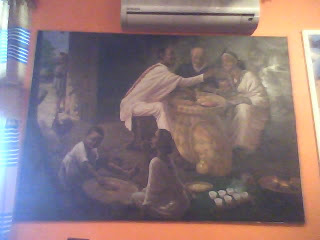 African Town always play Ethiopian pop music and I love its characteristic jangly rhythms, hand drum beats and the slightly staccato way the singers weave their tunes. They have a bar where people come and go, stopping to chat and sip a short black (Ethiopia is the birthplace of coffee) or imbibe in a beer, Ethiopian or otherwise. The Lega Tibs was good, with tender lamb, but I think they might have toned it down for us somewhat. I would have liked lots more green chillies! A word about injera: it's made from a fermented batter, so it has a tangy sourdough taste. It's cooked like a pancake that isn't flipped, so one side is covered in little bubbles, perfect for soaking up spicy juices. Traditionally, it's made with a native Ethiopian grain called teff, but here in Australia it is made from a blend of different flours. The combinations are a great way to try a bit of everything. This one had nine different tastes, but not what was advertised on the menu. 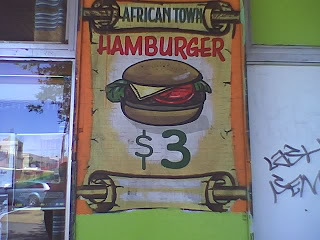 I don't mind at all if restaurants substitute what is good on the day, but the last time I went to African Town, the exact same thing happened - they skipped some of the vegie dishes and replaced them with more meat ones, and I even think they repeated one. Vegie dishes are often the most interesting - it's easy to make meat flavoursome, but to make a great vegie dish requires a defter hand. Despite the great music and my cold Ethiopian beer, I began to feel a little disappointed. There were no chicken pieces in the doro wat, it was mainly gravy, and not one of the dishes had any chilli heat. 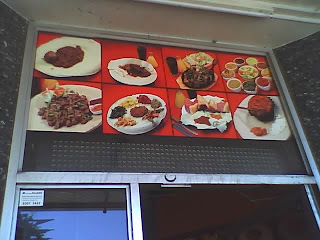 This is not how I remember it being a few years ago, where each dish had its own discrete level of spiciness. I wonder if now they are more popular, they are "dumbing down" their curries, as they think that is what the customer wants? We had two Ethiopian beers each and it came to $22 each. Despite my quibbles, the food was delicious and we were stuffed to bursting point. 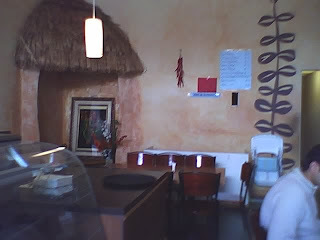 The restaurant has really friendly service and a great atmosphere (they are really kid-friendly, too). I just think it's time for me to spread my wings and find a new favourite. 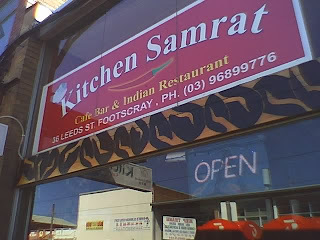 Popped into town to pick up some Kitchen Samrat for a lazy lunch. $16 for two curries and four naans (two with garlic). They now do dosas! These wafer-thin, crispy pancakes are made of a fermented rice and lentil batter. They're stuffed with spiced potatoes, eggs or cheese and rolled into a huge cigar shape. Looking forward to eating in soon so I can try them. Today we had Chicken Tikka Masala and Malai Kofta. The Chicken T.M. 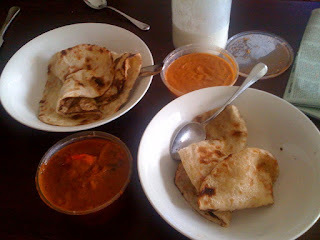 was great - pieces of chargrilled, marinated chicken in a thick tomato gravy, with onions and red capsicum. This dish is a modern one, and one story goes that an Indian chef in Glasgow created it when a customer complained his chicken tikka had no gravy. Although chicken tikka is traditionally served dry, the chef improvised a sauce of tomato, spices and cream, and the dish was born. It is now so popular in the UK that in 2001 it was named a new national dish of Britain. Unfortunately, we were disappointed in the Malai Kofta. These are torpedo-shaped balls of paneer cheese and potato, lightly spiced and deep-fried before being served in a very rich, creamy sauce. The balls tasted old and the sauce itself had an unpleasantly strong cheesy flavour. We didn't finish it. Nevertheless, we have always been impressed with Kitchen Samrat in the past so we won't let this break our stride. Maybe their new dosas will make up for it!